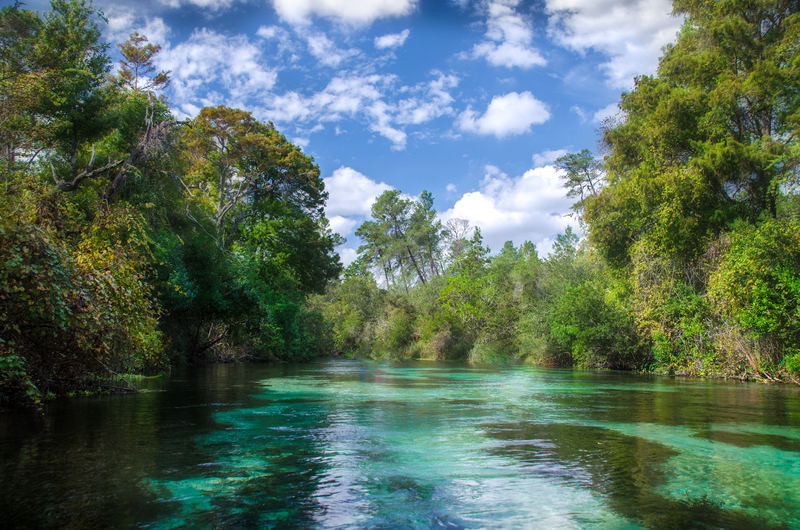 The Weeki Wachee River, located in Hernando County in the town of Weeki Wachee. 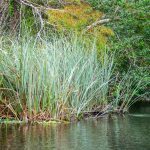 It is a 12 mile long river, flowing in a westerly direction from Weeki Wachee to the Gulf of Mexico. The source is the deepest naturally occurring, first magnitude spring in the United States, discharging from 112 to 150 million gallons of water a day. As with most Florida Springs, the water temperature averages 72-74° the year round. 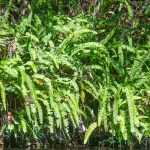 Designated an Outstanding Florida Waterway in 2003, the river flows through open marshes and the southern portion of the Chassahowitzka Wildlife Management Area. Wildlife is abundant along the first few miles of the river. 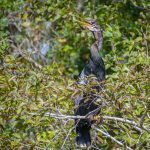 Herons, Eagles, Egrets, Wood Storks and more call this river home. 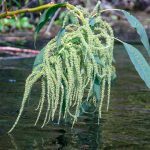 Theres is a diverse variety of trees from hardwoods to subtropicals that provide a pleasing canopy for much of the paddle. During cooler weather in winter, West Indian Manatees make their way from the Gulf of Mexico up into the river to enjoy the warmer water. 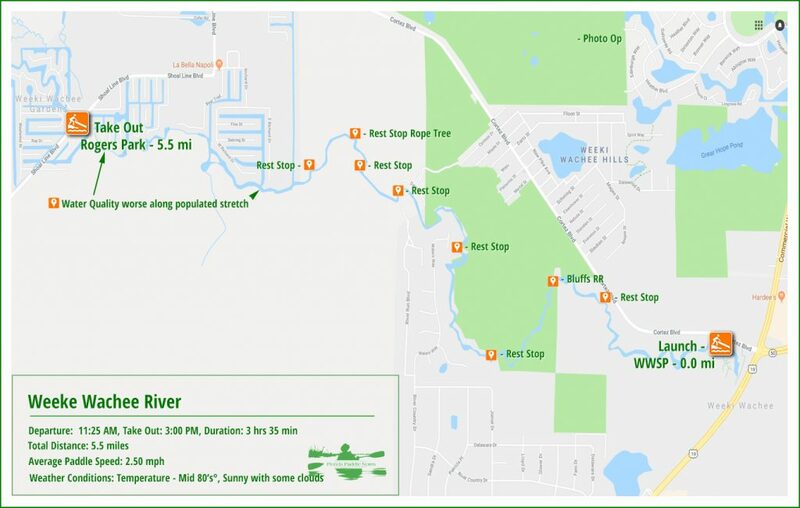 On the down side, the Weeki Wachee River has a high rate of nitrates and can be clearly seen paddling mile 4 to 5 where the residential communities align the river. 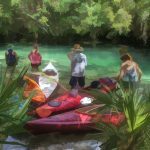 The Boating in Florida website has all the information you need about paddling on the Weeki Wachee River. Take Out Point: The take out point is at Rogers Park, 7240 Shoal Line Blvd, Weeki Wachee, FL 34607If you have to park your car at Rogers Park it is $5.00 payable by Credit Card only!. 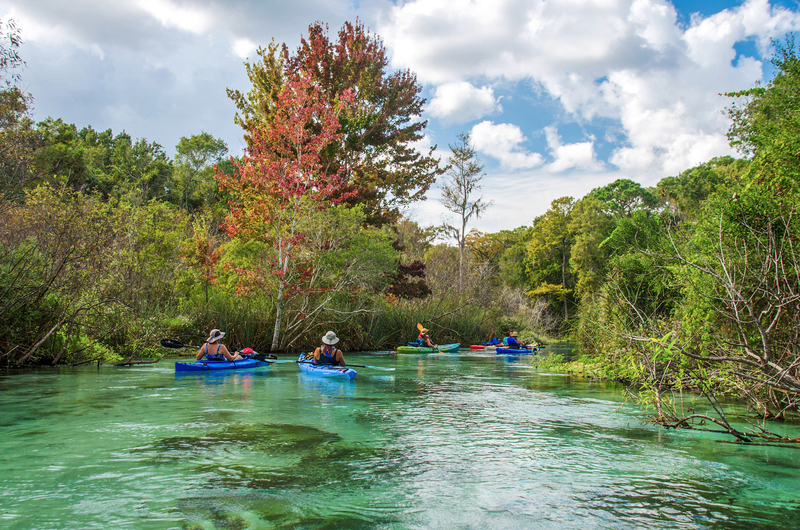 Paddle Distance: Launching at Weeki Wachee State Park and paddling to Rogers Park is a 5.5 mile paddle. Difficulty: Easy to moderate. I say moderate because the river is fast flowing and there are several sharp, narrow turns that need to be made that may prove difficult for beginners. Average Paddle Speed: 2.5 mph. Current – Tidal: The river flows in a West-Northwesterly direction with a swift current at the start, slowing somewhat further down river. Not until you pass the take out at Rogers Parks and get closer to the Gulf do tides influence the river. Side Paddles: Side paddles are not applicable on this portion of the river. Rest Areas: Restrooms available at the launch as well as the take out. Along the river, there are numerous areas to exit your boat and relax. After checking in at the Boating in Florida office, there is a staging area where kayak carts are available to walk your kayak down a paved road approximately 400′ to the launch. Here attendants will check your paperwork, check your coolers for alcohol as well as glass containers. not allowed on the river. PFD’s are required for launch and may be removed once on the river. The paddle begins! This river is one of my favorites that I have paddled on. The water is so clear, with sandy bottoms giving off a wonderful blue and aqua hue almost the entire length. The river starts out with a swift current, around 3 mph perhaps a little more. It is noticeably cooler once on the river. 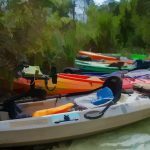 Throughout the paddle, at least in the first 4+ miles, before reaching the denser populated area, there are numerous spots to enjoy a shallow sandy beach will resting, snorkeling or having a lunch. There are several marked in the paddle map above. On today’s paddle the temperature was perfect, the sky was blue with scattered white clouds which leads to great photography, being able to capture crisp colors that aren’t washed out. Dahoon Hollies were the predominant tree on most of the run. 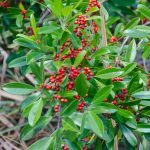 With bright red berries, these trees bordered the entire river. 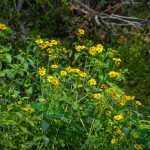 Complementing the Hollies, were numerous patches of Tickseed Marigolds, with bright yellow flowers dominating the shoreline. 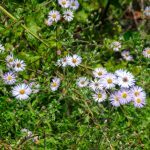 Along with the flowering marigolds were numerous clumps of Climbing Aster with their light and purple star blossoms. We enjoyed a wonderful canopy of Hollies, Maples, Cedars, Cypress, Bay, Palms, Gums and Oaks. The weather, being warmer than usual this time of year, has probably kept the Manatees from swimming up the river. 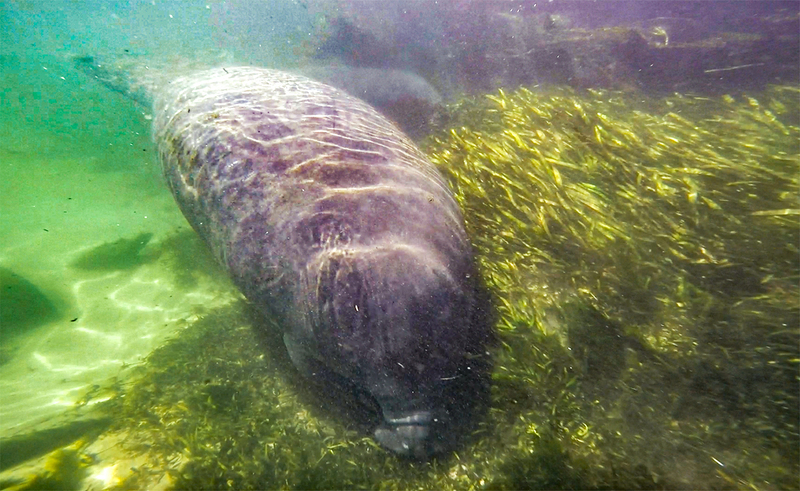 Usually this time of year several West Indian Manatees can be seen. 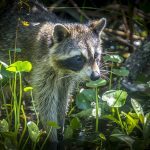 The first mile of the paddle is through an open marsh and here we have seen otters, raccoons and several water birds such as Anhingas, Cormorants, Herons and Egrets. There is quite a bit more wildlife to be seen during different times of the year. Wood Storks, Alligators, Turtles, Ibis, Lumpkins are just a few species that can be seen along the river. Mullet are easily seen swimming below the surface and occasionally jumping out of the water. Just after four miles into the paddle, the last mile and a half residential homes line the river. While the homes are quite interesting to look at with their nautical river themes, the water quality is not as interesting. 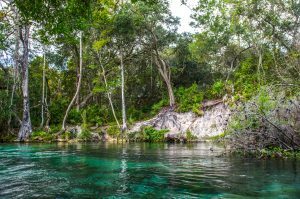 According to the Department of Environmental Protection, Weeki Wachee Spring has the highest nitrate concentrations of any the springs in the Springs Coast Basin and is evident by the greener appearance of the water. In all, this was a fantastic day and a fantastic river to paddle on. The vivid colors of the water, the floral bloom and diversity of the trees made it such a pleasurable trip. The many stops along the way to rest in a shallow sandy bottom beach were perfect. This is definitely a paddle to enjoy during the week while school is in session to avoid crowds, though the park does limit the amount of folks able to launch each hour. Always a favorite and always rewarding, ending another chapter in Florida Paddle Notes. As always the descriptions and photos are incredible. Can’t wait to paddle this river. Thanks Jack. We’ll have to do it one day…one of my favorites! I’ve been following you on FaceB but this is my first time to your blog. Fabulous presentation! The best of anything like this I have seen. as far as the Weeki… my daughter has paddled it many times and always raves about it. Do you stay overnight in the area when you paddle it or just make a day trip? Glad you enjoy the blog Harriet. We make the one day drive to Weeki Wachee and then come back.. Makes for a long day.